Heat a glug of olive oil on a large frying pan (you could even use a paella pan), peel and finely dice four shallots and crush two garlic cloves, if you haven’t got a garlic crusher, finely dicing them will be okay – add both to the pan and cook on a very low heat until the shallots become translucent. Boil 1 litre of water or (if you want extra flavour) 1 litre of vegetable stock, leave to one side for a moment. Now add four tbsps of white wine vinegar to the pan, meanwhile measure out 200g of Arborio rice, rinse with cold water before adding to your pan. Take off the heat and make sure your rice is coated in the oil and white wine mixture now add that stock/ water, add just enough so your pan won’t spill over, if there is mixture left over, keep it to one side, you’ll need it later, if not, boil up some more! Leave to cook out for 10 minutes, keep an eye on your pan and add water/stock when necessary. After 10 minutes add the juice of one lemon, leave the lemon to one side, then add your black pepper and sea salt seasoning. I never give measurements for seasoning; I think it’s important to season your food to your personal taste. 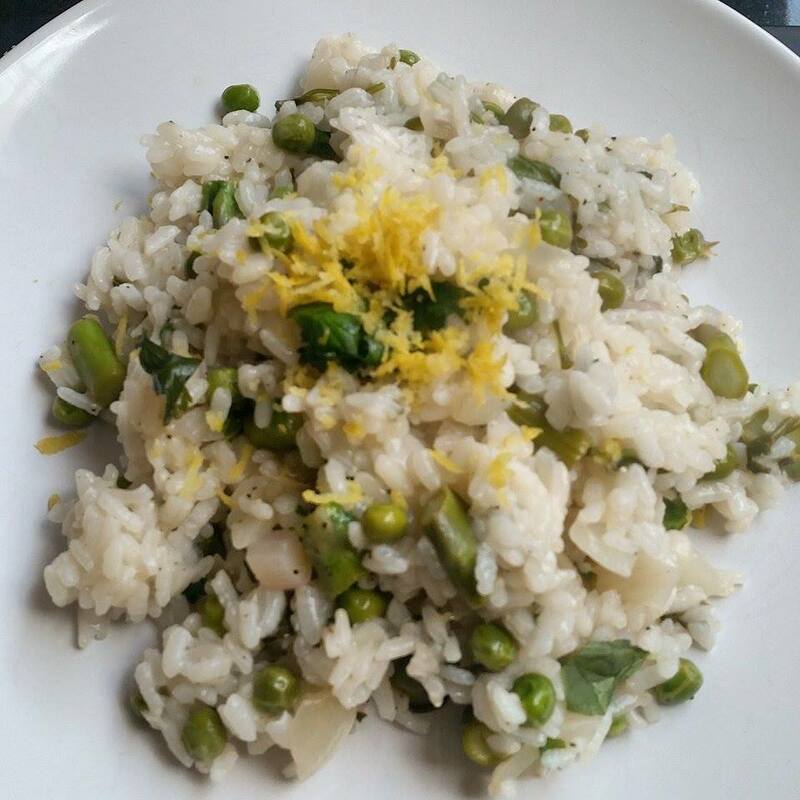 Leave to cook for a further 5 minutes, whilst the rice is cooking, wash and trim 6 asparagus, cut into 1cm pieces and after 5 minutes add them to the pan along with ¾ of a cup of frozen garden peas. Add more water/ stock to the mix if needed. Cook out for a further 10 minutes. Take your risotto off the heat, add the juice of another lemon, then wash and add a handful of roughly chopped fresh coriander, spinach, rocket and watercress, season once more with sea salt and black pepper. Make sure your risotto ingredients are well mixed; mixing now will mean that your salad leaves will wilt nicely, even though your pan is off the heat. To serve, grate the zest of one unwaxed lemon over your risotto.